I am so excited to share this couple and their beautiful wedding at the Lesner Inn Virginia Beach. Adam & Emily are some of our favorite people! Full of laughs, fun, and energy, they make everyone around them feel like an old friend! After our epic session with them out in the desert, we have been counting down the months until we got to party with them again! When I say party, they definitely know how to throw a party! Their night was so fun and there was so much love and excitement for these two that it was contagious! I feel so honored that I get to be included when the bride is getting ready. It is such a moment of anticipation and so much emotion. Watching Emily get ready to marry the man of her dreams was overwhelming. Her gracefulness and beauty were even more radiant than before. I loved watching her with her girls and her mother. So excited for the upcoming moments awaiting. When Emily put her dress on, we were all just speechless. She was absolutely stunning and she was ready to become Mrs. Davis! The First Look was absolute perfection! Adam & Emily decided to do a First Look. I am so glad that they did! We decided on a spot near American Brew in Virginia Beach. There is a pier right behind American Brew and it was the perfect spot for these two. Throughout the day it had misted, but for the first look it had stopped and we were able to bring these two together! Their reactions were priceless! So many smiles and so many hugs! The Lesner Inn was the perfect accommodation for their ceremony and party. Once E-3 entered the scene, the dance floor was packed to the max! Emily even had a second dress which was super cute that she changed into during the reception. After a night of dancing and celebrating the two went off with a grand sparkler exit. Adam & Emily… Thank-you for such an adventure! We absolutely love you guys and we cannot wait to see you again one of these days in Arizona! We will definitely have to visit you again! Thank-You to these Awesome Vendors! 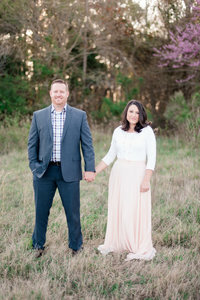 Check out Adam & Emily’s epic engagement session here! Adam & Emily are having a baby! See that HERE!